While out thrifting I ran across another Vintage Pyrex piece to add to my collection. This one is bright yellow with a sunflower on top. I remember my Mom having Pyrex in brown and green while I was growing up. I wonder what ever happened to that stuff. If our Mother’s only knew how sought after this dishware would become they would have handed it down to their daughters. Right now I have my collection in a cupboard. I have been searching for 3 years for just the right corner hutch to use as a display area. So far the perfect piece has not been found. I will search a little longer and if nothing turns up, that strikes my fancy, I will have hubby make me one. By the way I only paid $3 for my new piece and the money goes to hospice, couldn’t go to a better cause. How do you display your collections? How pretty Dawn. 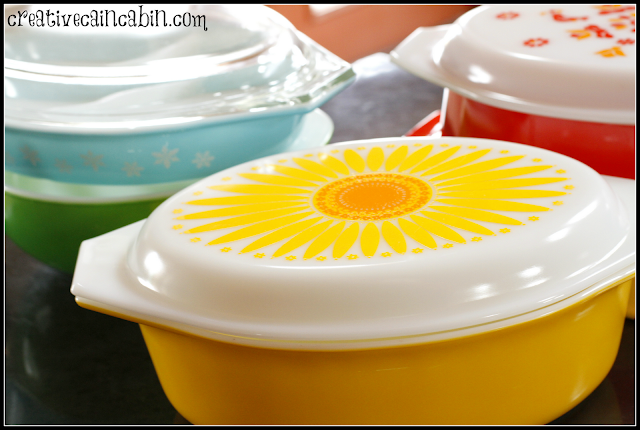 I have never seen Pyrex with lids like that. They are so you! I have been using Pyrex since I was first married in 1957. My first piece was a Turquoise and White casserole dish. I still have it and use it almost every week. I have added a lot of pieces since then and could not imagine being without them. I love your yellow piece!!!! I love it all! Especially the yellow one!!! Love your collection!! I’ve never seen ones with lids like these. I really like the sunflower one. I’m sure you will find the perfect display piece very soon. You have a knack of finding just the right thing. Stay warm and happy Friday Dawn! 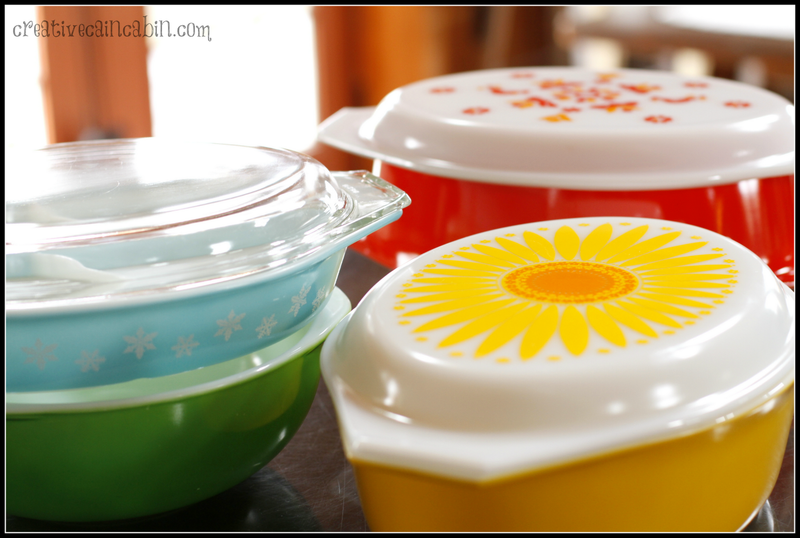 You have such a cute collection of pyrex casserole dishes. I love the happy colors. it may be just around the corner! Heck, I’m still using the pyrex I received for wedding gifts! Love your new sunflower one. There is an antique shop near here that has a pyrex museum with colors I’ve never seen before. Correction, the museum is within an art gallery (used to be in the antique store!). If you google Pyrex Museum, Bremerton, WA, you’ll pull up some info and photos. Thought you may like to see them. I’m so glad you joined in this week, Dawn! I’m jealous of your Pyrex collection. I’ve been looking at all the vintage pyrex out there in blogland and must admit that I’m thinking of starting a collection! But where to put it???? What a terrific collection! 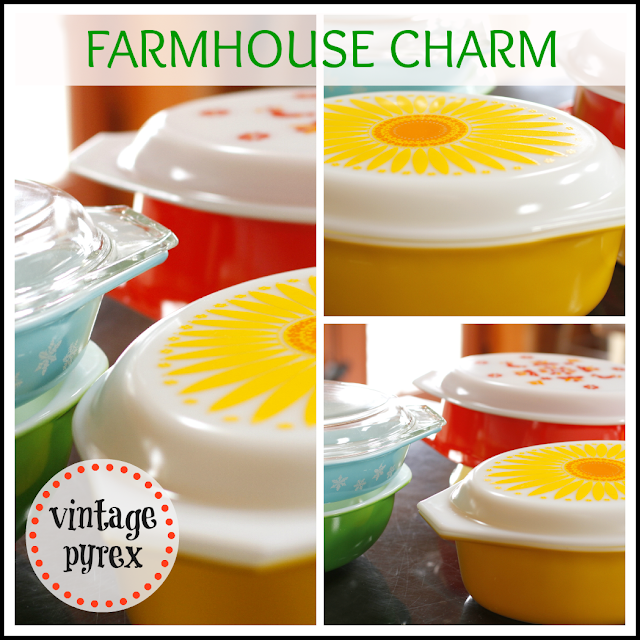 I love the separated Pyrex vegetable dishes and have started collecting those. I see you have a couple in your picture. They are so cute on the table. 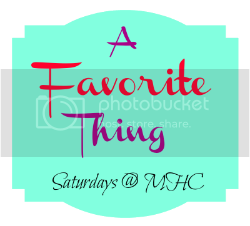 Visiting from A Favorite Thing Saturday and am your newest follower. Please stop by Still Woods Farmhouse for a visit! I guess you would have to call me vintage too 🙂 I received a lot of pyrex for my wedding shower. I’ve used it all my life and love it. 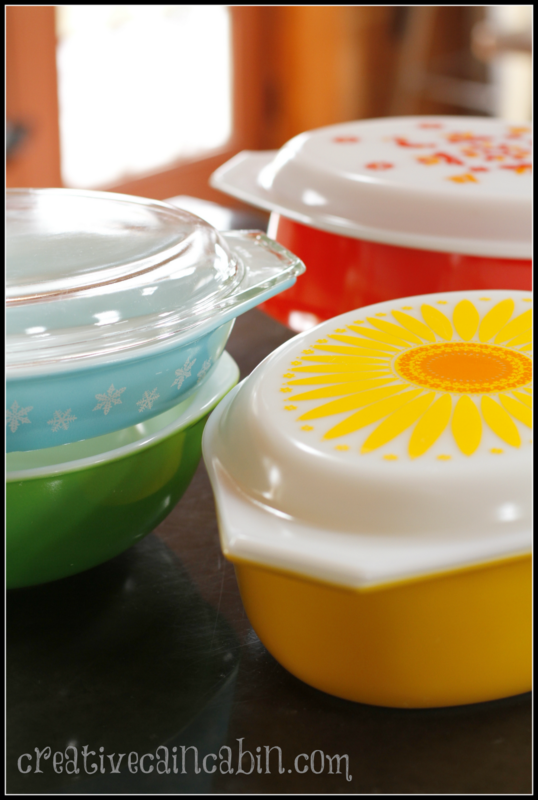 Your Pyrex collection is lovely! What a great collection! I love those colors! Dawn, I just saw a piece like your sunflower piece in my local shop. I’m SO tempted to go back and buy i! Yep, deep regrets! 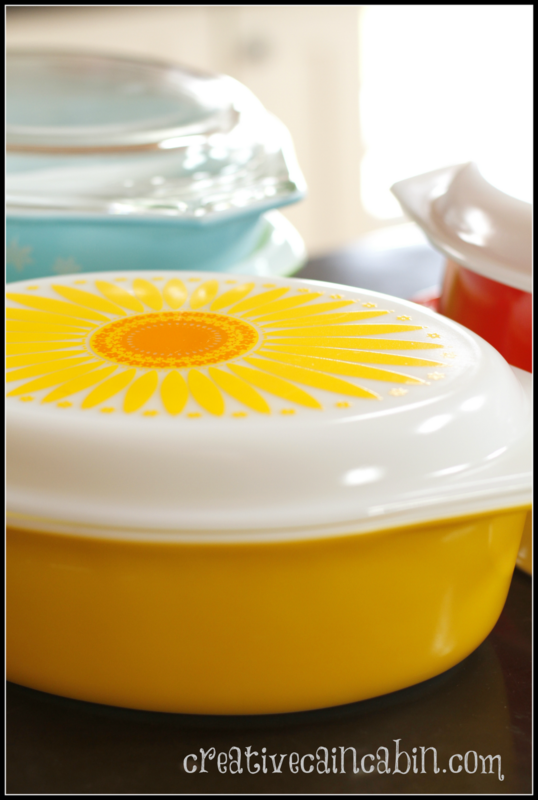 I received several pieces of Pyrex as shower and wedding presents (including the sunflower casserole), but do not have a single piece left. Sigh, oh well!